Esther is about finding your voice. It's about us as people of faith entering into a broken world, standing up and saying something is wrong even if it might mean our own death. As a young girl in the late 1970’s and early 80’s there were no “Disney Princesses” like there are today. But, for me, there was Queen Esther. Every summer my sister Jessica, my cousin Stacy and I would spend a couple of weeks with our grandparents. The three of us played hard all day long and created many memories. One year my grandma instituted “daily quiet time” and would send each of us into a separate room with quiet activities. (I think Grandma was the one who really needed the quiet time.) My favorite quiet time activity was a small carousel of bible story cassettes Grandma used for her Sunday school class. 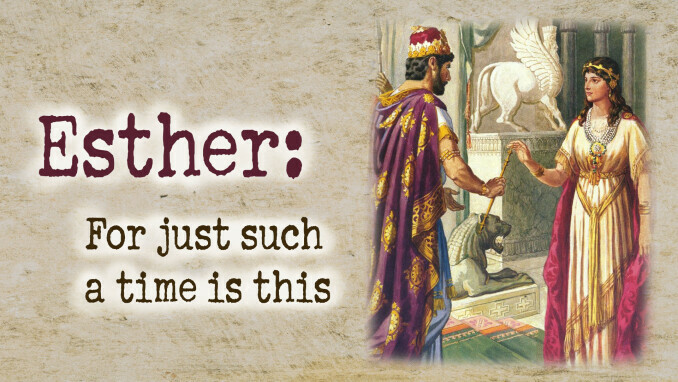 I really enjoyed listening to all the children’s versions of bible stories, but Esther became my favorite and I’d listen to the tape over and over. I loved to imagine what it would be like to be chosen queen, to stand up for what was right and to save my people. Esther was my hero. Esther’s pivotal moment is when she learns of Haman’s plot, a decree to kill all the Jews throughout the kingdom. At first, she is hesitant to go before the king because he has not called for her in 30 days. But Mordecai, her uncle, replies, “Don’t think for a moment that because you’re in the palace you will escape when all other Jews are killed. If you keep quiet at a time like this, deliverance and relief for the Jews will arise from some other place, but you and your relatives will die. Who knows if perhaps you were made queen for just such a time as this?” (Esther 4:13-14 NLT) Esther then fasted and prayed for three days before going to see the king and revealing Haman’s plan of killing the Jews, including herself. The Jews were saved because Esther stood up for justice. Al shlosha d’varim haolam kayam, al haemet v’al hadin v’al hashalom. The world is sustained by three things, by truth, by justice, and by peace. When Esther realized that she was “made queen for just such a time as this” she stood up for truth and justice. Does there come a time in each of our lives when we’re called to stand up for truth, justice and peace? I believe the answer to that question is yes. My 5th graders and I have discussed how the call to stand up and do what’s right will look different for each of us. We might be called to stand up to a bully, or to feed the hungry, or to be an advocate for a loved one’s medical care, or to fight for institutional justice. The list goes on and on. What is it that you and I are being called to do? How can we stand up for truth, justice and peace in our daily lives? We might not be put in a place to change history. But we can certainly make a difference in someone’s life. Holy God, thank You for all the gifts and blessings that You’ve provided. We pray for courage and strength when it’s time for us to stand up and do what’s right. Open our eyes to those around us who need help and are hurting. Please surround us with Your love and care when we feel hurt and alone. Amen. Written by Jennifer Roberts. Jennifer leads the children's choir and the beginning handbell choir. She lives in Ashburn with her husband Ben and their son Ethan.